Northrop Grumman Innovation Systems is an American aerospace manufacturer and defense industry company that operates as the aviation division of parent company Northrop Grumman. It was formed as Orbital ATK Inc. in 2015 from the merger of Orbital Sciences Corporation and parts of Alliant Techsystems, and was purchased by Northrop Grumman in 2018. Innovation Systems designs, builds, and delivers space, defense, and aviation-related systems to customers around the world both as a prime contractor and as a merchant supplier. It has a workforce of approximately 12,000 employees dedicated to aerospace and defense including about 4,000 engineers and scientists; 7,000 manufacturing and operations specialists; and 1,000 management and administration personnel. Former logo of Orbital ATK, the company's original name following the merger of Orbital Sciences Corporation and the supoff aerospace division of Alliant Techsystems. A merger of Orbital Sciences Corporation and the defense and aerospace divisions of Alliant Techsystems (ATK) was announced on April 29, 2014. The two companies had collaborated on several previous projects, including the use of 400 ATK rocket motors in Orbital's launch vehicles. The deal officially closed on February 9, 2015. ATK's sporting-goods division spun off to form Vista Outdoor on the same day. Based in Chandler, Arizona, the Flight Systems Group includes the Pegasus, Minotaur, and Antares launch vehicles as well as solid-propulsion and aerostructures programs. The company also operates a Lockheed L-1011 TriStar wide body jetliner, which is named Stargazer and is used to air launch Pegasus rockets carrying payloads into space. The Stargazer aircraft is also used for testing under specific programs. The Defense Systems Group, based in the Baltimore, Maryland area, produces tactical missiles, defense electronics, and medium- and large-caliber ammunition. The division also produces fuzing and warheads for both tactical missiles and munitions; precision metal and composite structures for medium and large-caliber ammunition, military aircraft, ground vehicles, and missile systems; load, assembly, and pack (LAP) of medium caliber munitions; and propellants and powders for the canister and commercial markets. Orbital ATK's Space Systems Group provides satellites for commercial, scientific, and security purposes. 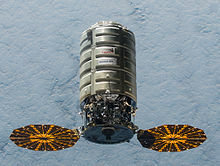 This group also produces the Cygnus spacecraft, which delivers cargo to the International Space Station. The group is based at the company's headquarters on Warp Drive in Dulles, Virginia. 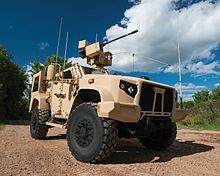 2016 Oshkosh L-ATV (configured as a JLTV) equipped with EOS R-400S-MK2 remote weapon system integrated with Orbital ATK’s M230-LF 30 mm lightweight automatic chain gun. A product of Orbital ATK: The machine cannon M242 Bushmaster as standard armament of the infantry fighting vehicle M2 Bradley. Orbital ATK holds a trademark on the term "chain gun". The spacecraft Cygnus transporting cargo to the ISS on behalf of NASA. SES-16, communications satellite for SES S.A.
Mk310 PABM-T air burst rounds for MK44. XM25 CDTE, an airburst grenade launcher. ^ a b c Berger, Brian (February 12, 2015). "Orbital ATK Org Charts Detail the Newly Merged Company". SpaceNews. Retrieved February 19, 2015. ^ a b "Company Overview". Retrieved 25 February 2017. ^ "Orbital ATK will become Northrop Grumman's fourth business sector". ^ Aitoro, Jill R. (April 29, 2014). "Why the merger of ATK and Orbital Sciences makes sense". Washington Business Journal. Retrieved February 19, 2015. ^ a b c d Wall, Mike (February 10, 2015). "Orbital ATK, Merger of Orbital Sciences and ATK, Begins Operations". Space.com. Retrieved February 19, 2015. ^ "30mm & 20mm x 173mm Munition System". www.orbitalatk.com. This page was last edited on 8 March 2019, at 15:27 (UTC).